A year ago, the characters and basic plot line for a three book series dumped into my head all at once. Looking back, I don’t even know if I thought of a character or the premise or the plot first. It showed up all at once and demanded to be written. I wrote it. All three books, one after the other. They were messy drafts. Quick drafts. But special. I edited, rewrote, edited, and rewrote book 1, Dare. When it was ready, I worked up the courage to send it to Nadine Brandes, who sent it back with a bunch more edits and helpful comments. 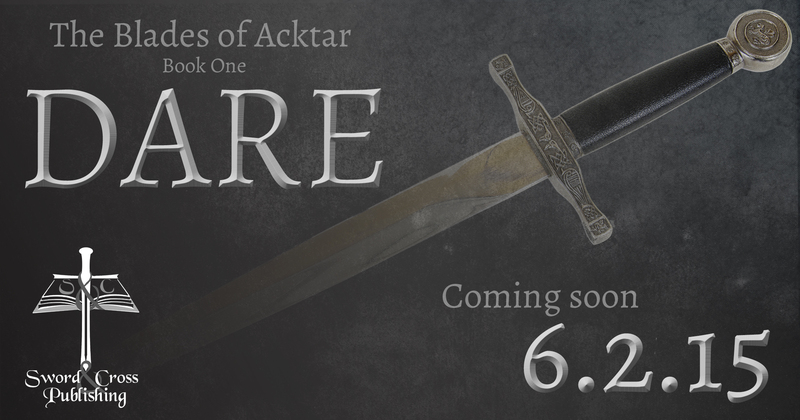 I’m putting on the final polish and can announce: After researching my options for a over year while I was writing and editing, I decided to publish Dare with my own Indie publishing label Sword & Cross Publishing. Roseanne White designed the logo, which I’m so excited to see on the spine. Third Blade Leith Torren never questions his orders or his loyalty to King Respen until an arrow wound and a prairie blizzard drive him onto the doorstep of the girls whose family he helped destroy. Question: Had you already personally met Nadine Brandes before you sent your novel to her? Or did you send your work to her because she was a published author you liked? At the time I sent my manuscript to Nadine, I hadn’t met her in person nor had I read anything by her since her first novel A Time to Die published in October that year and I applied for an edit by her in August. I discovered her a little by accident. I read a book by Jill Williamson published by what was then Marcher Lord Press (it is now Enclave Publishing). I then went to Marcher Lord’s website and started tracking down books published by them and visiting those author websites. Nadine wrote a number of blog posts for Marcher Lord, so I stalked her over at her website and learned that she was an editor. Eventually, I kept tracking down really good things about her editing skills and made the decision to apply for her Shalom edit. And it all went from there.